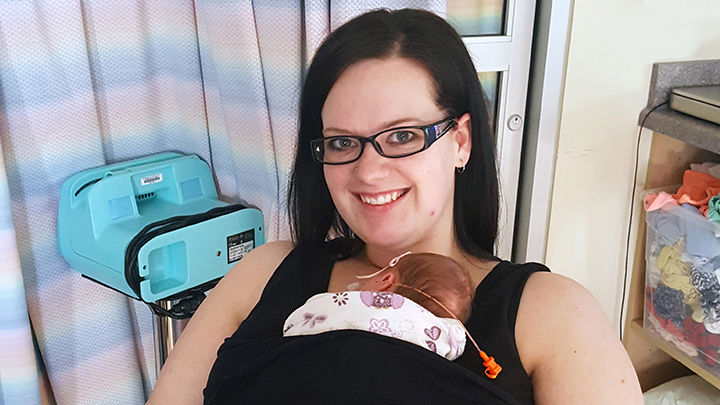 New mom Brittny Emsley uses a Joeyband to snuggle safely with her newborn daughter Charli in the NICU of Queen Elizabeth II Hospital in Grande Prairie. GRANDE PRAIRIE — What started as a fall-prevention strategy in the Neonatal Intensive Care Unit (NICU) here at QEII Hospital has found success in more ways than one. Since January 2017, families in the NICU have had the opportunity to use Joeybands, a wide band of elastic fabric that wraps about the body to securely hold a baby in place against their parent’s chest. From a safety standpoint, the Joeyband — inspired by the pouch kangaroos have for their young — keeps a baby securely in place for parents and grandparents, while leaving their hands free. “Parents have told us they feel baby is more secure and they feel more safe (with the Joeyband),” adds Nadean Dort, Pediatrics/NICU unit manager. Joeybands are used only when parents are in a seated or reclined position, not during walkabouts. The band’s design eliminates strain on the neck, back or shoulders — and gives healthcare staff easy access to the baby if the need arises. As well, they allow the whole family to bond with baby in a safe, secure manner. As a preventative safety measure, the use of Joeybands has proven successful. “We have not had any falls,” says Dort. The bands also provide an added safety measure for tired parents who may be worried about falling asleep while holding their infant. The NICU keeps five Joeybands on hand, in different sizes, to accommodate visiting families.